Our Weight Loss program is medically supervised. 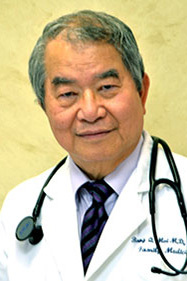 Our doctor is board certified in internal medicine and family medicine. We provide diet and exercise counseling. Prior to treatment, a review of your history and medical conditions are reviewed, as we stress safety in our program. We strive to be the best Weight Loss Program in Houston. It's all about the calorie balance. This means if you eat more calories than what your body use, the extra calories will be stored as fat and you will gain weight. People tend to underestimate the amount of food they eat. It is often the snacks, sweets, alcohol, sodas and food from fast food restaurants that are unaccounted. All it takes is an additional 500 calories per day, which is not a lot, to increase your weight one pound per week. Over one year, you will gain 50 pounds. Just do the math; there are 52 weeks in one year and one pound=3500 calories. Similarly, if you have a deficit of 500 Cal per day, you can lose one pound per week or lose 50 lbs per years! Briefly, BMI (body mass index), which describes relative weight for height, is an important indicator of total body fat and overall health. Calories or Cal is a unit of potential producing energy produced by food. Calories are used to standardize how much energy is in the food we eat. We can also use calories to measure how much energy we burn when we exercise. Many studies support the benefit of weight reduction in improving different medical conditions. Examples are as follows: 1)reducing the risk of diabetes, 2)reducing blood pressure, 3)improving cholesterol, 4)decreasing the risk of arthritis and most importantly, death rate is lower in those trying to lose weight, even if they did not actually lose weight. Options for weight loss include behavior modification, dietary therapy, exercise, drug therapy, and bariatric surgery. 1. Obesity is directly related to hypertension, diabetes, high cholesterol, coronary artery disease and gallbladder disease, arthritis, sleep apnea, irregular menses, cancers of esophagus, stomath, endometrium, breast, prostate, colon, pancreas, lymphoma and multiple myeloma. 2.Obesity will decrease life expectancy. Studies show those who were overweight at age 40 (BMI 25 to 30) lived about three years less. Those who were overweight at age 40 (BMI over 30) lived about six to seven years less. 3. Americans are among the fattest people in the world. Defined as BMI >30, the percentage of obese men nearly doubled between 1991 and 1998, and the percentage of obese women increased by 50 percent. 4. Obesity in childhood has almost doubled in the United States in the last decade. 5. Obesity at age 18 is associated with increased mortality 20 years later. Estimates indicate an increased relative risk of approximately 1.5 for all cause mortality and 2.0 for cardiovascular mortality. 6. Waist > 35 inches for female, or > 40 inches for male correlate with increase risk of coronary heart disease and diabetes. 7. A drop in weight of 2.2 pounds can decrease your blood pressure by approximately 1mmHg. Those who maintain weight loss tend to maintain lower blood pressure than those who regain weight. a. The initial weight loss occurs fairly rapidly when you first start. Early on, you tend to lose more water and sodium to balance the negative charge of the ketones being excreted by your body. Later on, your body compensates and breaks down fat instead. There are no negative charges or ketones in fat breakdown, and the body does not need to excrete sodium to balance the charge. Hence there is less water loss. But this is good! You want to archieve fat breakdown. So be patient. b. The second reason is fairly straight forward, but patients often forget. Basically, as you lose weight, you will need to adjust your goal weight to continue to lose weight. The simple reason is that when you lose weight, your calories requirement decreases. This means that you will need to eat less to continue to be in negative calorie balance to lose weight. 9. Consider surgery if your BMI is > 40 and traditional methods of weight loss, such as diet, exercise and medications, have failed. 10. In morbidly obese patients, bariatric surgery was more effective at producing weight loss than non-surgical treatment. Studies show a difference of weight loss of 70 pounds at 1-2 years follow up and 44 pounds at 8 years follow up. 1. To lose one (1) pound per week, you will need to achieve 500 calories deficit per day from your normal calories burned. 2. To lose weight, you must achieve a negative energy balance. Based on average energy requirements, females generally should eat approximately 1,200 Cal/day and males 1,500 Cal/day to lose 1 lbs/week. Of course, the exact calorie goal will be dependent upon each individual. 3. Try to eat a balanced diet of carbohydrate/protein/fat in ratio of 55% /15% /30%. Include fiber of 20g/day and calcium of 1,000 to 1,500 mg/day and a multivitamin (MVI) tablet daily. 4. Stay away from "empty" calories that do not benefit the body, such as sodas, sweets, and alcohol. 5. If you must eat out, eat smart: a)eat half of what you order, b)ask for a "to go" box when your food comes out so you can split it in half, 3)ask for your sauces on the side, as sauces are rich in calories. 6. Get a scale and weigh yourself. Tracking your weight and measuring your progress in critical for success. 7. If your BMI is over 30, consult a physicia. There may be other medical conditions that may be attributing to your weight gain. 8. Exercise! Exercise! Exercise! If you're self motivated, do a minimum of 30 minutes per day. Otherwise, join programs such as 24 Hour Fitness, LA Fitness, Curves,Yoga, Pilates, or join the variety of dancing programs that's available in your community. 9. Choose a realistic goal for weight loss. A reasonable goal is 1 lbs of weight loss per week. Alterrnatively, you can go for a 10% reduction in body weight within a 6 months time frame. 10. Finally, always stay positive in your endeavor. Everybody will have a bad day, so when you have a bad day, don't give up. A positive attitude will lead to success!